The Castelli Hotel, located near Laganas on the Ionian island of Zakynthos, has been honored with the Sustainability Award at the TUI Northern Region Awards, during the World Travel Market trade show, which was recently held in London. 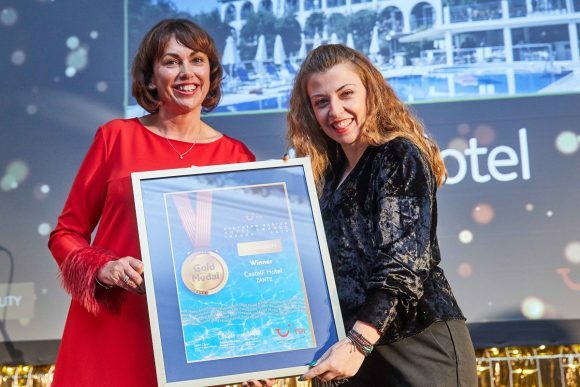 The awards give the opportunity to TUI Group, TUI Nordic and TUI UK & Ireland to honor their hotel partners for the invaluable “smiles“ they provide to the 20 million customers that the tour operator sends on holiday each year. The Castelli Hotel received the Sustainability Award (Overall Winner) for “its long-term commitment to quality tourism and sustainable development,” an announcement said. 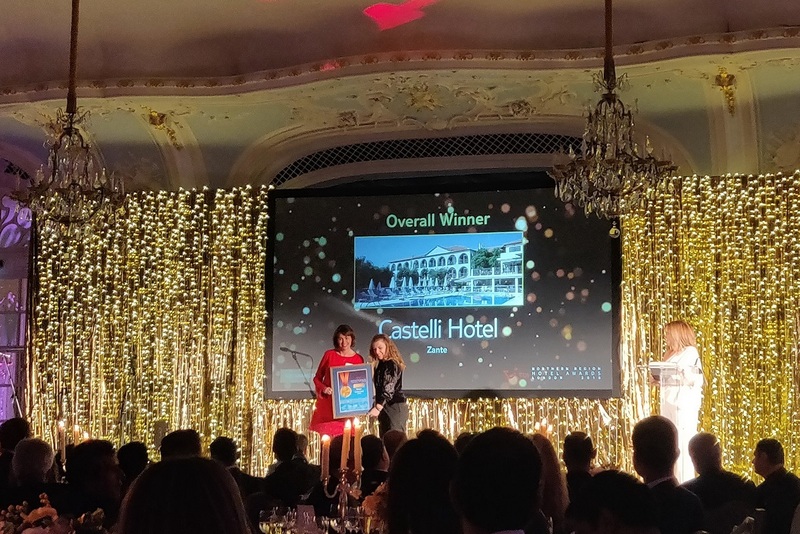 Castelli Hotel owners Maria Lougari and Antonis Nikoloudakis also thanked the hotel’s staff, associates and suppliers for making this distinction a reality through their services. The award was received by M. Zougra, public relations officer of Castelli Hotel, and Athina Kardari head of the Zakynthos Municipality’s tourism department. The Castelli Hotel was established 26 years ago, with an emphasis on sustainability. Its first architectural design included the island’s oldest eucalyptus, which is protected and today stands in a prime location within the premises. 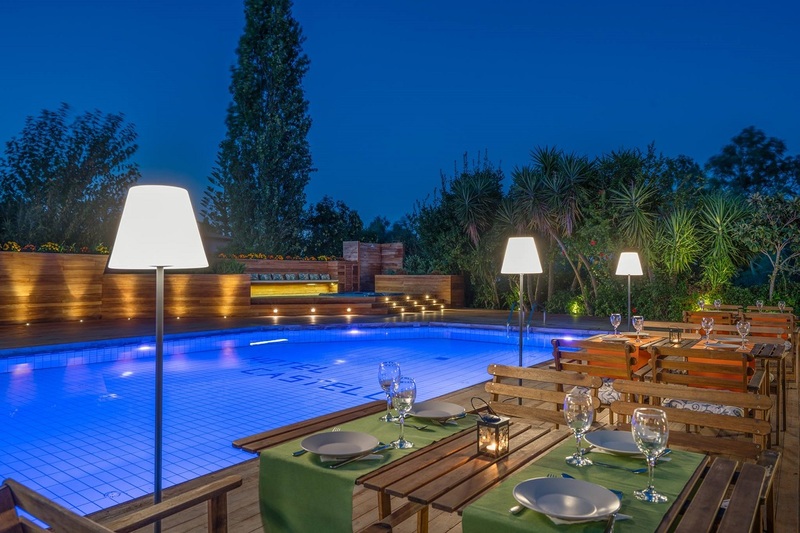 In 2016 the management opened a restaurant under the name “Eucalyptos” (eucalyptus in Greek) to offer the hotel’s guests the best of the local cuisine. During their stay at the Castelli Hotel, guests have the opportunity to learn more on the rich nature of Zakynthos, its products and flavors; visit the hotel’s farm; experience the island’s customs and feel like a local. 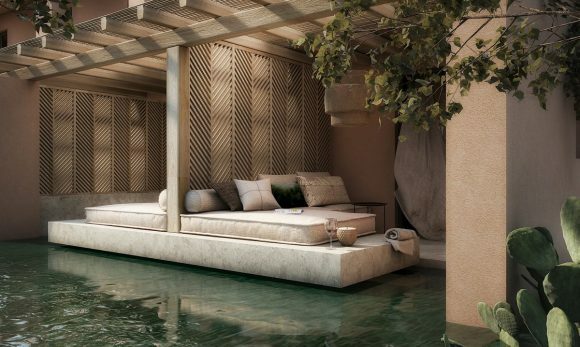 “It’s been quite a challenge for us to combine all these environmentally friendly practices with the sense of luxury and relaxation that this boutique hotel offers,” Maria Lougari said. The Castelli Hotel features 56 rooms and suites offering luxury amenities and authentic hospitality.